Find out which share price rose as much as 471% and why another dozen stocks at least doubled in Q1. Our former AIM writer of the year has all the detail. AIM is still underperforming the Main Market over a 12-month period, but the junior market's performance is more in line with its Main Market counterparts in the first quarter of 2019. The FTSE 100 index and the FTSE All-Share index both rose by just over 8% in the first three months of the year. AIM as a whole has underperformed with a 6.8% gain, but the FTSE AIM 100 is 9.2% higher and the FTSE AIM 50 UK index has increased by 10.7%. International stock markets have been rising in the first quarter, too. The Dow Jones Industrial Average index has done even better with a 11.2% gain and the Nasdaq 100 has risen by 16.6%. The German DAX rose by 9.2% and the Hong Kong Hang Seng index by 12.4%, while the gold price has declined slightly during the period. The one index that AIM has significantly outperformed is the FTSE Fledgling, which has fallen by 6.2%. The inclusion of previously large companies, such as Debenhams (LSE:DEB) and Moss Bros (LSE:MOSB), which have slumped in recent months, appears to have held back this index. Ross Group (LSE:RGP), whose price has trebled, is still only worth £4.9m. Associated British Engineering (LSE:ASBE) has doubled, and it is valued at £600,000. Neither company will have a significant weighting in the index. Individual company weightings are likely to be behind the strong performance of the AIM 50 and AIM 100. In the previous quarter ASOS (LSE:ASC), mixer drinks supplier Fevertree (LSE:FEVR) and robotic software developer Blue Prism (LSE:PRSM) all suffered sharp share price falls. In the case of ASOS it was a reaction to poor trading news, but the other two were highly rated, which exacerbated the effect of the generally weak stock market. They are also more liquid than many other AIM companies, so they are easier to sell. ASOS has recovered on the back of more reassuring trading statements and Fevertree and Blue Prism have continued to perform strongly, with the latter raising £100m at 1,100p a share. The strong performance of these three companies is also why the performance of the AIM 50 is better than the AIM 100, because they have a greater weighting in the AIM 50 than the AIM 100. The three companies make up nearly 22% of the weighting for the AIM 50, and 13.7% of the AIM 100. 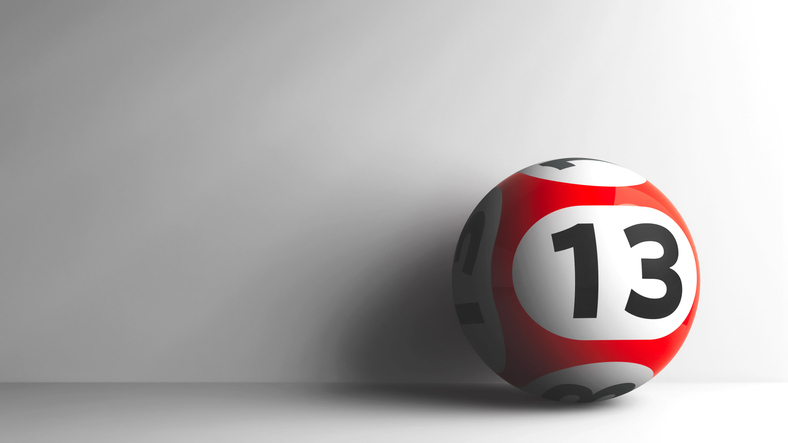 Direct carrier billing services provider Boku (LSE:BOKU) and video games company Codemasters (LSE:CDM), the other two top performers in the AIM 100, combined are valued at less than 50% of Blue Prism, which is the smallest of the three larger companies. There were 39 risers in the AIM 50 and 11 fallers. In the AIM 100, there were 76 risers and 24 fallers. Looking at AIM as a whole, there were 13 AIM companies where the share price at least doubled in the first quarter. Footasylum (LSE:FOOT) has trebled thanks to the bid from JD Sports but the share price has still halved in less than 18 months since joining AIM. 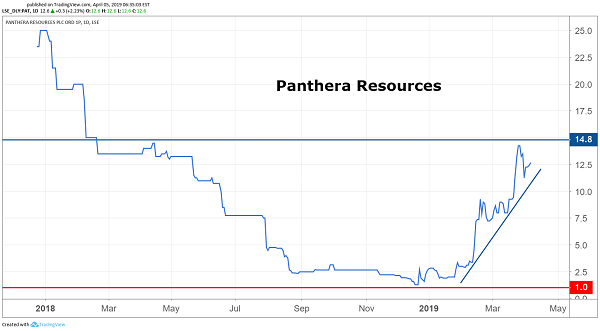 Panthera Resources (LSE:PAT) was boosted by an agreement allowing it to explore the Labola gold project in Burkina Faso – at their peak, the shares were up 471% in 2019 - while Integumen (LSE:SKIN) attracted interest because of positive results from trials of its Labskin technology combined with cannabinoid oil. The majority of the 13 companies are well below their highs of the past few years. Bidstack (LSE:BIDS) was previously known as Fitbug, among other names, so the 99% share price decline over the years relates to that former business. The share price has consistently risen since the reversal of the company that has developed a live bidding platform for digital advertising signage inside video games into the shell. The global video games market is valued by Newzoo at $134.9bn, and Bidstack provides the opportunity for generating money from advertising that does not hamper the gamers experience. The 2018 figures for Bidstack show a loss as revenue generation is in its early stages. Management expects this year to be second half weighted as revenues begin to accelerate. Sexual health company Futura Medical (LSE:FUM) is reporting its 2018 figures on Wednesday 10 April. There has been little new information from the company, but the share price peaked at around the time of the R&D day in February. Lombard Odier has been using the rising share price to trim its stake and it has been reduced from 24% at the start of the year to 17.5%. Last year, Futura raised £5.85m at 7p a share and Lombard Odier acquired most of its stake at that time, having previously reduced the existing shareholding. In October, the first patient was enrolled in a European phase III study for MED2002, a gel for the treatment of erectile dysfunction that is the main focus for Futura. The trial has taken into account feedback from potential partners and regulators and headline data is expected before the end of 2019. The cash raised last year will finance this study. Futura is also talking to potential distribution partners for its CSD500 erectogenic condom, where development is complete, and potential out-licensing partners for pain relief product TPR100. However, it is MED2002 that offers the further upside. 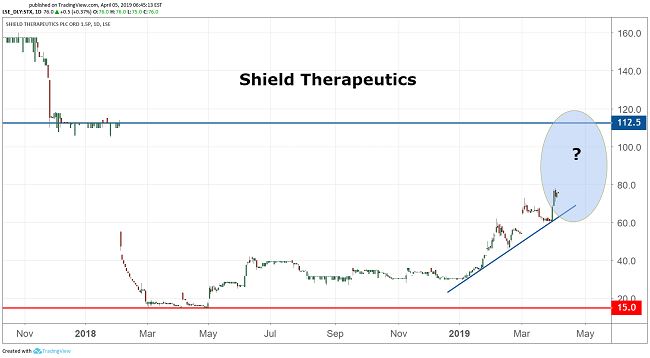 The Shield Therapeutics (LSE:STX) share price has exactly doubled over the period, but it remains well below the level around one year ago when it was forced to publish inconclusive trial results, which gave a negative impression. The full results were not as bad as they initially seemed, but it has taken time for the share price to recover. The recent strength in the Shield share price was due to a successful study comparing its Feraccru iron deficiency treatment with an intravenous (IV) treatment called Ferinject. Feraccru provided at least as good treatment as the IV treatment without the additional costs and time related to an IV product. This triggered a further milestone payment of €2.5m from Norgine, which has the rights to Feraccru in Europe, Australia and New Zealand. There are further potential milestone payments due and sales royalties of up to 40%. Promotion of Feraccru has started in the UK and Germany. The European market covers 40 million patients. A new drug application for Feraccru has been submitted to the FDA in the US. The target date for completion of the review is 27 July. Shield is already looking for a partner in the US. The data already gathered does mean that Feraccru has a good chance of success. The experience of Motif Bio, the sixth worst performer on AIM in the first quarter, with the FDA shows that nothing can be guaranteed, though. Shield has enough cash to take it well into 2020 and potential to earn more from upfront and milestone payments from existing and new partners. This is important because it gives it time to choose the right partners. There is still further potential for the share price from the existing approvals and there would be even more upside from US approval for Feraccru. Litigation funder Manolete Partners is set to grow rapidly over the next few years. After initially hovering just above the December flotation price of 175p, a trading statement in February saying that the figures for the year to March 2019 would be better than expected, sparked a sharp rise in the share price. Eco (Atlantic) Oil & Gas (LSE:ECO) has just taken advantage of its share price strength to raise £12.9m in an oversubscribed placing at 80p a share. The main focus of the business is the Orinduik block, offshore Guyana. The funds raised will finance Eco's share of up to four new exploration or development wells, in addition to the two wells already scheduled. The drilling programme starts in two months. Eco owns a 15% working interest in the block with Total (EURONEXT:FP) owning 25% and Tullow Oil (LSE:TLW) 60%. According to the latest competent persons report Eco's share of the net unrisked prospective resource is 267.3 million barrels of oil and 210 billion cubic feet of gas – based on the low estimate. One of things that also appears to have provided added impetus to the share price is the inclusion of the company in the TSX Venture index.